¿Qué tal amigos? It's been a while! At least it felt like it for me, it's been a jam-packed week. We spent half the week up in good 'ol Lakeville. My lovely “birthplace” (first mission area)! So, because of that we didn't get much time for work in our own area, but it was still fantastico. To start the week off, we spent the day on exchanges with the zone leaders up in their area. It was a blast! I got to go back to Prince of Peace, which is the foodbank where we volunteered when I was serving there. I got to say hi to some old staff. We talked to a ton of people, but unfortunately no return appointments. Then at the very end of the day we saw this young guy named Loui, just kicking a soccer ball around. We started talking to him and he was the most humble teenager! Right as we started teaching him though, this guy walks out of the building and just stares us down as he's walking to his car. Then he tried to yell us off, so that sadly drove away the spirit. We weren't in the mood for confrontation so we went on our way. Unfortunately, that happens way too often, and it's sad because he seemed so excited about the gospel! Anyway, we still had a great exchange. Oh, and I forgot to mention, I was with Elder Kjar for the day and he went to Eagle High! We spent the night with the ZLs so the next morning we could drive up to the mission home for New Missionary Training!! It took pretty much all day, but it was SO good! Training has been going great and it's honestly probably helped me more than it's helped my companion. I needed a good refresher on the basics! 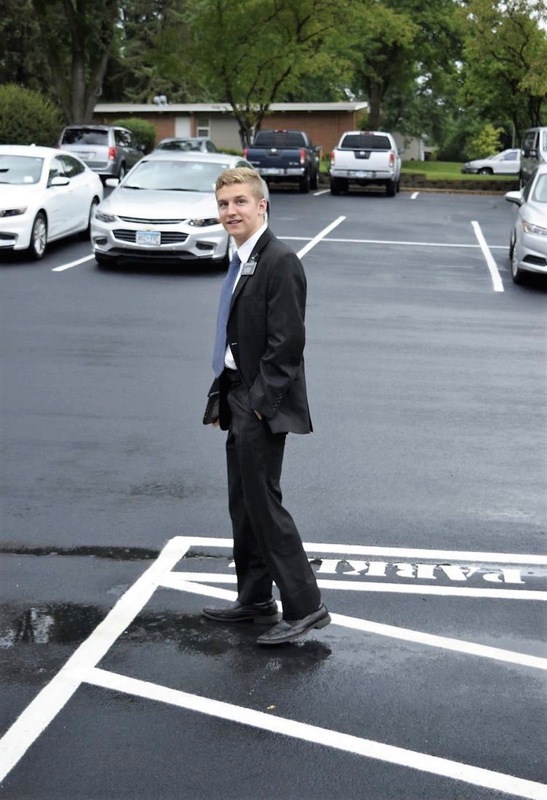 Elder Woolley is already such a solid missionary. Greenie fire is real! Lol. También, we went alllll the way back up to Lakeville on Saturday for interviews, which took up most of the day. But they were great! And I also got some news that since I don't get to practice much Spanish with my companion and the limited amount of Spanish work here, I can start skyping the other Spanish missionaries in the cities. And both my previous companions are in St. Paul, so that will be divertido! On Thursday we spent the whole afternoon doing work way out in New Ulm, which is about 40 minutes away. We had some solid lessons up there but they went a bit long, so we rushed back to Mankato for our dinner appointment. Then in the evening we went out with Brother Peterson, the Elders Quorum president of our ward.. and we went all the way back out to New Ulm for another visit! Haha, so a lot of driving time, which is annoying. But we had an awesome lesson with a less active family in the ward as well as a new family who just moved in and the daughter is preparing for a mission! Then, the next day we spent the morning helping Bro Peterson build a massive raised garden box and filling it with some black Minnesota dirt. It's always fun to get a little dirty! One funny little side note, Minnesotans are overly proud about two things, 1) Their winters. and 2) Their DIRT! haha cracks me up. One super cool highlight from the week - We felt like we should see one of our former investigators and see how he was doing. A Hispanic guy named Germán. And that means a lesson in Spanish! Woo! I'm glad I had the Holy Ghost on my side though because teaching solo can be a little stressful. But we read with him a chapter in the Book of Mormon that is filled with prophecies of Christ and his mission, that he will be born of Mary and take upon himself our sins, our pains, and our sorrows. The Spirit hit him like a rock! 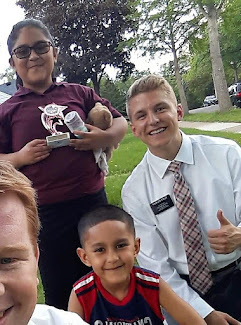 He started to tear up and tell me that now he understands, when he read the Book of Mormon in the past he read the story of Lehi and his family but didn't really understand the purpose of the book and so he gave up on keeping commitments to prepare to be baptized. But the spirit that he felt taught him what he couldn't understand before, that the Book of Mormon testifies of Christ our savior and His atonement, and fortifies our witness of His divinity. And now he said he would start reading again and pray about baptism again! Super awesome miracle! It truly is amazing how the Holy Spirit enlightens our understanding. It is through the witness of the Spirit that we come to KNOW all truth! This is how I know that Christ is my personal savior, and that this is His church!